I wasn’t expecting to fall in love with Kurseong. From what I’d heard about our father’s childhood, this mountain town in West Bengal was a sad place where he was sent, in 1946, as a four-year-old who had fallen so far into despair over losing his beloved dadu that he was sent away for four years, until he was eight years old, until our thakurda got a job abroad and our family relocated to North Carolina in 1950 for good. “I thanked your thakurma later,” he told me, shaking a strong fist, “for sending me away and making me become a man. She’d just hang her head, though, when I said that.” He’d shrug with that last line, like it was silly for her to feel bad for sending her baby away. “She didn’t want to do it?” I asked. So he was sent away to boarding school, 4,680-odd feet in the sky on the very top of a very tall segment of the Himalayas, 364 miles from home in Calcutta, where his older brother, mother, and father continued living before Partition. During those four years in Kurseong, Dad only returned to his family for holidays. The school itself, called Dow Hill, was actually a Scottish girls’ school at the time and, like the ones in the segregated southern U.S. he’d later encounter, it was mostly white. It was only because he and his cousin were the nephews of their masi Bijoya, who taught history there, that they were admitted. I cannot say that our dad’s time in Dow Hill was happy. He was still grieving his deceased grandfather, who was his best friend, when he was torn from his family to go to this boarding school, which was a whole other kind of loss. And so he lived among a clutch of 1940s Scottish-descended teenage girls who felt entitled to make little-Indian-boy bodies do what they pleased. “I used to get in trouble for eating rotten fruits. And for scraping chocolate off the floor to eat.” He would run his fingernail across dry air when he said this, then laugh. 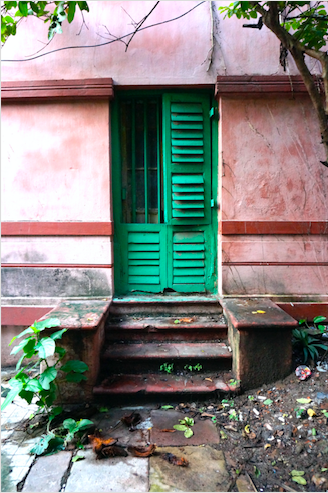 “Bijoya would strike me with bamboo poles!” he would say, good-naturedly, slicing the space between us. “I wasn’t starving, though. I’ve seen pictures of myself. I had full cheeks.” This last bit added, as if to dull the blade. We’d grown up with our dad telling these offhand stories. In a sense, they were what called us to Kurseong during the two-month research project I was conducting in India to trace our family history. My desire was to unhook these hurting bits from our dad’s heart that he’d carried with him for maybe his whole life—hurting bits that my sisters and I might be carrying too. All along, I had thought Kurseong would feel haunted, that I would want to track someone down. I joked about wanting to punch someone (not our long-dead thakurma or our aunties, of course . . . but those girls, maybe). So when we arrived to Bagdogra, the nearest airport, I wasn’t expecting to breathe in the green of the Himalayas on a slow switchback climb past towering mango trees with their hard, sour fruits, aching to be pickled, or to find myself falling toward the gentle tumble of the Balasan River, where village kids dove headlong into rushing waters, or to swoon for long cloudy views of terraced tea gardens, or the signs warning drivers to give way to drunken elephants who regularly plundered tribal people’s fermented corn and grain, or to be given access to the storytelling of our generous guide and driver, Sabin, who told us about growing up the son of a mother who secreted sacks of the best tea to dry, twist, and ferment at home, because folks who work the land should have the best of what they labor for. I wasn’t expecting stories of the ironwood trees called Tarika that shrunk as they aged and looked like the hala trees I knew from living in Oʻahu, becoming more dense and sounding like stone when they were cut for long-lasting firewood, or the cicadas that told local kids when it was playtime (they were loudest in the morning), or, how our dad and other mountain kids would venture into the forests to collect massive block-sized, flying beetles to battle to the death. I wasn’t expecting Kurseong, known for its azaleas, the land of the white orchids. As we wandered into our umpteenth stop on the side of the road, mid-climb up to the Cochrine Hotel, Sabin handed me, wordlessly, a flat string of lemongrass for the mosquitoes he saw me itching away. I wasn’t expecting any of this. When we arrived at Dow Hill School, I was expecting the chills I got later as we walked past the dorms, as I gazed into the faces of the older teachers, as the current headmistress told us that she had no records to show us of the kids Dad went to school with, even though we all knew that these old colonial schools hold onto every single paper they write on. When we finished the tour of Dow Hill and the school’s guide left us, Dad and I gravitated toward a large puddle turned reflection pond inside the school’s gates on a gravel roadway. D, my then-partner and traveling companion, stood just behind us but a ways off to give us privacy, as Dad and I considered the Victorian-style school before us. It looked massive. Clouds misted across it, erasing buildings and clumps of trees, only to reveal them and take them away again. Dad was visibly uncomfortable. Maybe he was thinking about the mountain. About wanting to make it to Darjeeling before the rain. About wanting to descend a bit out of this cloud before we lost light or the roads got too slick. He’d angled his body toward the front gate, toward Sabin, who brought us there. He was clamping down, this much I knew from being his daughter. He didn’t want to talk about this anymore, which meant I had to let go my desire to exorcise this place from our father’s heart. He surprised me when he did, finally, speak out the truth of this place. Of the scars it left on his heart and mind, of how it changed how he saw himself and what he thought he could offer the people he loved, the women he welcomed into his heart. When the clouds rolled in, bleaching everything around us like a bright white screen, he was finished. He shrugged hard, maybe not to communicate that he didn’t know so much as to shake the story out and off him. I stepped back and hugged him around the narrowest part of his torso, my hands resting on top of his belly. I pressed my ear to his back and listened to his heart thump. “Oh, this gut of mine!” he said. When he smacked his belly, the moment shattered like water, as it must. D appeared from the periphery, where I found out later he’d been taking pictures of us: me, the half-Bengali daughter standing awkwardly and looking very American in a mismatched kurti and leggings, eyes downcast, my thumbs hooked into backpack straps; Dad standing akimbo, confronting the school with what might have been a scowl on his face. It’s hard to tell from the camera’s angle, and I can’t recall since I wasn’t looking at him, but that’s how I see his face in this moment in my mind. Looking back, I know that all of this helped. We hadn’t come to collect ledgers to name names, to seek vengeance, or to clutch pain and hurt close to our hearts. We’d come to look this space in the face, to find those pieces Dad left in the forest and in this school as a child, and to hold them close, to tell them that they are not lost, that we carry them with us, and that they are safe now. That we love them. That we are loved. Maybe that’s how love works. Waiting for us after sixty-plus years, filled with all these things we don’t expect, in what could be the most unsuspecting and devastatingly beautiful places.